WE WATCHED them arrive a few months ago and very quickly they got down to laying their eggs but it was not until this week that they coaxed their bairns out of the nest to take that first leap of faith to fly. 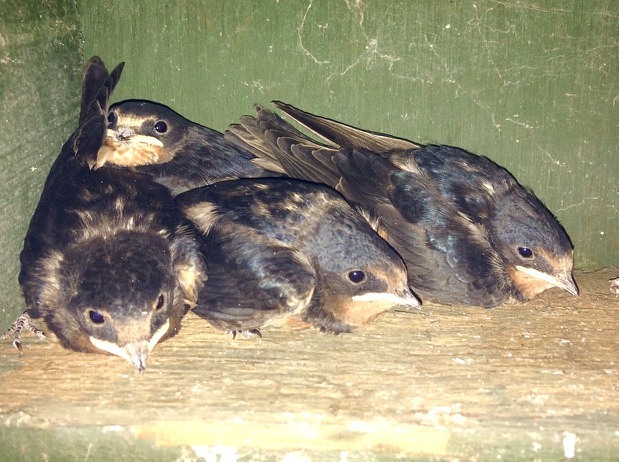 It’s one of the swallow families we have on the farm and in the golden, early morning sunshine, it was yet another special experience to walk into the stable with the young swallows flying in circles round and around my head. I just stood and watched them as they periodically stopped flying and clung to the walls momentarily before they once again leapt off and began flying in circles once more. After a few minutes they were clearly bored of the view below and followed their parents over the stable door and out into the farmyard. Each morning since that day I have seen them with their Mum and Dad flying up and down the paddocks and skimming across the tops of the spring barley in the neighbouring fields. Absolutely beautiful. Boo, our ‘not awfully good at rounding up the sheep’ Border Terrier, has taken it upon herself to chase the swallows as they dart across the top of the newly cut grass between the paddocks. She does catch many things that move around here and she is very quick, but I think she is very much on a loser with that little challenge. The weather has certainly improved around here this week and I’ve spent lots of time outside but I keep getting distracted by wildlife. One afternoon, as I walked between the paddocks, the rabbits scattered. One ran in front of me then made a U-turn back across my path. What happened next was, like a ball of dust rolling across the field with legs, feet and fur flying in all directions. I’m guessing the stoat family have got young ones to feed. With temperatures noticeably improving, it was rather uncalled for to have our immersion heater go on the blink. With the immersion not working, it means we have to resort to our only other method for heating up the water. I have to light the stove then shovel buckets of coal into it so I can keep the women folk around here happy. Showers, baths and yet more showers, but as long as they’re happy, I’m happy! Well, it’s that time of year again and late one afternoon our Wendy and I set off, armed with tools to gather as much elderflower as we could carry, in as many baskets and buckets as we could find. Thankfully, we don’t need to walk too far to stumble across vast amounts of the stuff. Working as a team, I listened to my orders, “only the large heads in full bloom and not those past their best”, (whatever that means) we then cracked on and soon had every basket and bucket filled to busting and neither of us had got stung by the nettles. Wendy can now get on with making her elderflower cordial, which I must say, is delicious, and that’s probably why she sells truck loads of the stuff. In closing this week I have a question which I have been considering for some time as it’s been playing on my mind and I’m really a little unsure of what to think. The question is, and it’s not because I don’t like gardening, but who in the first place decided that weeds were weeds and not just unpopular flowers or plants? The thing is that I love so many of these so called weeds and they look great in our garden.